A high diversity of larger benthic foraminifera (LBF) fauna is recognized from the Ilerdian-Cuisian sedimentary succession for the first time of the Birjand region, Sistan Suture Zone of eastern Iran. These foraminifera are described in accordance with the standard shallow benthic zonation, placing considerable emphasis on biostratigraphic and microfacies analysis implications. Four shallow benthic zones (SBZ8 and SBZ10-12) have been designated in LBF horizons comprising index zonal markers such as Alveolina elliptica nuttalli (Davies), A. decipiens (Schwager), A. cf. oblonga, A. cf. minuta, A. cf. rugosa, A. cf. decastroi, A. aff. cremae, A. frumentiformis, A. aff. palermitana, N. cf. atacicus (Leymerie), N. tauricus (De la Harpe), N. pratti (d?Archia & Haime), N. polygyratus (Deshayes), N. cf. distans (Deshayes), Assilina sublaminosa (Gill), A. placentula (Deshayes), Asterocyclina cf. schweighauseri (Less), Discocyclina archiaci cf. staroseliensis (Less), and D. cf. archiaci bartholomei (Schlumberger). Five microfacies types including Alveolina-Opertorbitolites packstone (locally grainstone), nummulitids-Alveolina rudstone, Nummulites rudstone, Assilina-Nummulites rudstone, and orthophragminid-nummulitid pack-rudstone have been defined in the current study. Microfacies type 1 is finely characterized by high abundance of Alveolina with the predominance of A-form and globular to slightly elongate forms. Microfacies type 2 is dominated by small nummulitids in association with the abundance of the most diverse Alveolina species. Microfacies type 3 is composed of a diverse community of nummulitids, principally Nummulites A-forms along with Assilina. Microfacies type 4 is distinguished by a high diversity of not only A- and B-forms of Nummulites, but also Assilina specimens. Eventually, orthophragminids and nummulitids are common in microfacies type 5. Analysis of the Ilerdian-Cuisian deposits on the basis of the distribution of both biotic and abiotic components suggests depositions in a shallow ramp environment with deepening upward from the middle Ilerdian to the late Cuisian. Adey WH (1979). Crustose coralline algae as microenvironmental indicators in the Tertiary. In: Gray J, Boucot AJ, editors. Historical Biogeography, Plate Tectonics and the Changing Environment. Corvallis, OR, USA: Oregon University Press, pp. 459-464. Adey WH, Macintyre I (1973). Crustose coralline algae: a re-evalua- tion in the geological sciences. Geol Soc Am Bull 84: 883-904. Afzal J, Williams M, Leng MJ, Aldridge RJ, Stephenson MH (2011). Evolution of Paleocene to Early Eocene larger benthic foraminifer assemblages of the Indus Basin, Pakistan. Lethaia 44: 299-320. Aghanabati A (2004). Geology of Iran. Tehran, Iran: Geological Survey of Iran. Aguirre J, Riding R, Braga JC (2000). Diversity of coralline red algae: origination and extinction patterns from the Early Cretaceous to the Pleistocene. Paleobiology 26: 651-667. Ahmad S, Jalal W, Ali F, Hanif M, Ullah Z, Khan S, Ali A, Jan IU, Rehman K (2015). Using larger benthic foraminifera for the paleogeographic reconstruction of Neo-Tethys during Paleo- gene. Arab J Geosci 8: 5095-5110. Alavi M (1993). Paleozoic Stratigraphy of Iran. Treatise on the Geology of Iran. Tehran, Iran: Geological Survey of Iran. Anketell J, Mriheel I (2000). Depositional environment and diagen- esis of the Eocene Jdeir Formation, Gabes-Tripoli Basin, West- ern Offshore, Libya. J Petrol Geol 23: 425-447. Babazadeh SA, De Wever P (2004). Radiolarian Cretaceous age of Soulabest radiolarites in ophiolite suite of eastern Iran. B Soc Geol Fr 175: 121-129. Barattolo F, Bassi D, Romano R (2007). Upper E ocene larger foraminiferal–coralline algal facies from the Klokova Mountain (southern continental Greece). Facies 53: 361-375. Bassi D (2005). Larger foraminiferal and coralline algal facies in an Upper Eocene storm-influenced, shallow-water carbonate platform (Colli Berici, north-eastern Italy). Palaeogeogr Pal- aeocl 226: 17-35. Basso D, Nalin R, Nelson CS (2009). Shallow-water Sporolithon rhodoliths from north island (New Zealand). PALAIOS 24:92- 103. Bassi D, Nebelsick JH, Puga-Bernabéu Á, Luciani V (2013). Middle Eocene Nummulites and their offshore re-deposition: a case study from the Middle Eocene of the Venetian area, northeast- ern Italy. Sediment Geol 297: 1-15. Beavington-Penney SJ (2004). Analysis of the effects of abrasion on the test of Palaeonummulites venosus : implications for the origin of nummulithoclastic sediments. PALAIOS 19: 143-155. Beavington-Penney SJ, Wright VP, Racey A (2005). Sediment production and dispersal on foraminifera‐dominated early Tertiary ramps: the Eocene El Garia Formation, Tunisia. Sedimentology 52: 537-569. Beavington-Penney SJ, Wright VP, Racey A (2006). The middle Eocene Seeb Formation of Oman: an investigation of acyclicity, stratigraphic completeness, and accumulation rates in shallow marine carbonate settings. J Sediment Res 76: 1137-1161. Berberian M (1977). Against the rigidity of the Lut Block. Geol Min Surv Iran 40: 203-227. Braga JC, Bassi D (2007). Neogene history of Sporolithon Heydrich (Corallinales, Rhodophyta) in the Mediterranean region. Palaeogeogr Palaeocl 243: 189-203. Brasier MD (1975). The ecology and distribution of recent foraminifera from the reefs and shoals around Barbuda, West Indies. J Foramin Res 5: 193-210. Bröcker M, Rad GF, Burgess R, Theunissen S, Paderin I, Rodionov N, Salimi Z (2013). New age constraints for the geodynamic evolution of the Sistan Suture Zone, eastern Iran. Lithos 170: 17-34. Buxton M, Pedley H (1989). Short paper: A standardized model for Tethyan Tertiary carbonate ramps. J Geol Sci 146: 746-748. Ćosović V, Drobne K, Moro A (2004). Paleoenvironmental model for Eocene foraminiferal limestones of the Adriatic carbonate platform (Istrian Peninsula). Facies 50: 61-75. Ćosović V, Mrinjek E, Nemec W, Španiček J, Terzić K (2017). Development of transient carbonate ramps in an evolving foreland basin. Basin Res 30: 746-765. Costa E, Garcés M, López-Blanco M, Serra-Kiel J, Bernaola G, Cabrera L, Beamud E (2013). The Bartonian-Priabonian marine record of the eastern South Pyrenean foreland basin (NE Spain): a new calibration of the larger foraminifers and calcareous nannofossil biozonation. Geol Acta 11: 177-193. Drobne K (1977). Alveolines Paleogenes de la Slovenie et de l’Istrie. Schweiz Palaontol Abh 99: 1-132 (in French). Drobne K, Ćosović V, Moro A, Bucković D (2011). The role of the Palaeogene Adriatic carbonate platform in the spatial distribution of alveolinids. Turkish J Earth Sci 20: 721-751. Dunham RJ (1962). Classification of carbonate rocks according to depositional texture. In: Ham WE, editor. Classification of Carbonate Rocks—A Symposium. Tulsa, OK, USA: American Association of Petroleum Geologists Memoir, pp. 108-121. Eftekhar-Nezhad J (1980). Subdivision of Iran into different structur - al realms with relation to sedimentary basins. Bull Iran Petrol Inst 82: 19-28 (in Farsi). Eftekhar-Nezhad J (1986). Geological Map of Iran. 1:100000 Series, Sheet n. 7855, Birjand. Tehran, Iran: Geological and Mineral Survey of Iran. Embry AF, Klovan JE (1972). Absolute water depth limits of Late De- vonian paleoecological zones. Geol Rundsch 61: 672-686. Eva AN (1980). Pre-Miocene seagrass communities in the Carib- bean. Palaeontology 23: 231-236. Fermont WJJ (1982). Discocyclinidae from Ein Avedat (Israel). Utrecht Micropal Bull 15: 1-173. Flügel E (2010). Microfacies of Carbonate Rocks. 2nd ed. Berlin, Germany: Springer-Verlag. Ghose BK (1977). Paleoecology of the Cenozoic reefal foraminifers and algae-a brief review. Palaeogeogr Palaeocl 22: 231-256. Gilham RF, Bristow CS (1998). Facies architecture and geometry of a prograding carbonate ramp during the early stages of foreland basin evolution: Lower Eocene sequences, Sierra del Cadí, SE Pyrenees, Spain. Geol Soc Sp 149: 181-203. Hadi M, Mosaddegh H, Abbassi N (2015). Biostratigraphic inter - pretation and systematics of Alveolina assemblages in the Zi- arat Formation from Soltanieh Mountains (Western Alborz). Geosci J 95: 39-44. Hadi M, Mosaddegh H, Abbassi N (2016a). Microfacies and biofabric of nummulite accumulations (Bank) from the Eocene deposits of Western Alborz (NW Iran). J Afr Earth Sci 124: 216-233. Hadi M, Parandavar M, Kiani-Shahvandi M, Dabaghi Sadr F (2016b). The first marine record of the Bartonian Nummulites and Calcareous nannofossils at the Tihoiyeh section of the Jiroft area (Central Iran). In: EGU General Assembly Conference Abstracts, p. 9955. Haq BU, Hardenbol J, Vail PR (1987). Chronology of fluctuating sea levels since the Triassic. Science 235: 1156-1167. Hohenegger J (2009). Functional shell geometry of symbiont-bear - ing benthic foraminifera. J Coral Reef Stud 11: 81-89. Hohenegger J, Yordanova E (2001). Displacement of larger foraminifera at the western slope of Motobu Peninsula (Okinawa, Japan). PALAIOS 16: 53-72. Hohenegger J, Yordanova E, Hatta A (2000) Remarks on West Pacific Nummulitidae (Foraminifera). J Foramin Res 30: 3-28. Hohenegger J, Yordanova E, Nakano Y, Tatzreiter F (1999). Habitats of larger foraminifera on the upper reef slope of Sesoko Island, Okinawa, Japan. Mar Micropaleontol 36: 109-168. Hottinger L (1960). Recherches sur les Alvéolines du Paléocène et de l’Eocène. Schweiz Palaontol Abh 75/76: 1-236 (in French). Hottinger L (1974). Alveolinids, Cretaceous-Tertiary Larger Foraminifera. Irving, TX, USA: Exxon Production Research Company Technical Information Services. Hottinger L (1983). Processes determining the distribution of larger foraminifera in space and time. Utrecht Micropal Bull 30: 239- 253. Hottinger L (1997). Shallow benthic foraminiferal assemblages as signals for depth of their deposition and their limitations. B Soc Geol Fr 168: 491-505. Hottinger L (1998). Shallow benthic foraminifera at the Paleocene- Eocene boundary. Strata (Series 1) 9: 61-64. Hottinger L (2001). Learning from the past? In: Box E, Pignatti S, editors. Volume IV: The Living World. Part Two. San Diego, CA, USA; Academic Press, pp. 449-477. Hottinger L (2014). Paleogene Larger Rotaliid Foraminifera from the Western and Central Neotethys. Berlin, Germany: Springer. Hottinger L, Drobne K (1980). Early tertiary conical imperforate foraminifera. Rasprave 22: 188-276. Langer MR, Hottinger L (2000). Biogeography of selected “larger” foraminifera. Micropaleontology 46: 105-126. Lensch G, Schmidt K, Davoudzadeh M (1984). Introduction to the geology of Iran N Jb Geol Palaont Abh 168: 155-164. Less G (1987). Paleontology and stratigraphy of the European Orthophragminae. Geol Hungarica (Paleontologica) 51: 373 pp. Less G (1998). Zonation of the Mediterranean Upper Paleocene and Eocene by Orthophragminae. Opera Dela Slovenska Akademija Znanosti in Umetnosti 34: 21-43. Less G, Özcan E (2012). Bartonian-Priabonian larger benthic foraminiferal events in the Western Tethys. Austrian J Earth Sc 105: 129-140. Luterbacher HP (1984). Paleoecology of foraminifera in the Paleogene of the Southern Pyrenees. In: Benthos’83, 2nd International Symposium on Benthic Foraminifera, Pau, France, pp. 389-392. Luterbacher HP (1998). Sequence stratigraphy and the limitations of biostratigraphy in the marine Paleogene strata of the Tremp Basin (central part of the Southern Pyrenean Foreland Basins, Spain). In: de Graciansky PC, Hardenbol J, Jaquin T, Vail PR, editors. Mesozoic and Cenozoic Sequence Stratigraphy of Eu- ropean Basins. Tulsa, OK, USA: SEPM, pp. 303-309. Miller KG, Kominz MA, Browning JV, Wright JD, Mountain GS, Katz, ME, Sugarman PJ, Cramer BS, Christie-Blick N, Pekar SF (2005). The Phanerozoic record of global sea-level change. Science 310: 1293-1298. Mosaddegh H, Hadi M, Parandavar M (2017). Biostratigraphy of the Eocene carbonate deposits in the eastern part of the central Iran (Torbate-e-jam area): stratigraphic significance of Nummulites perforatus and calcareous nannofossils. Geosci J 102: 91-100. Okay AI (1989). Alpine-Himalayan blueschists. Annu Rev Earth Pl Sc 17: 55-87. Özcan E, Ali N, Hanif M, Hashmi SI, Khan A, Yücel AO, Abbasi İA (2016). A New Priabonian Heterostegina from the eastern Tethys (Sulaiman fold belt, west Pakistan): implications for the development of eastern Tethyan heterostegines. J Foramin Res 46: 393-408. Özcan E, Hanif M, Ali N, Yücel AO (2015). Early Eocene orthophragminids (Foraminifera) from the type-locality of Discocyclina ranikotensis Davies, 1927, Thal, NW Himalayas, Pakistan: insights into the orthophragminid palaeobiogeography. Geol Acta 27: 267-299. Özcan E, Less G, Báldi-Beke M, Kollányi K, Kertész B (2007). Biometric analysis of middle and upper Eocene Discocyclinidae and Orbitoclypeidae (Foraminifera) from Turkey and updated orthophragmine zonation in the Western Tethys. Micropaleontology 52: 485-520. Özcan E, Less G, Okay AI, Báldi-Beke M, Kollányi K, Yilmaz İÖ (2010). Stratigraphy and larger foraminifera of the Eocene shallow-marine and olistostromal units of the southern part of the Thrace Basin, NW Turkey. Turkish J Earth Sci 19: 27-77. Özgen-Erdem N, Akyazı M, Karabaşoğlu A (2007). Biostratigraphic interpretation and systematics of Alveolina assemblages from the Ilerdian–Cuisian limestones of Southern Eskişehir, Central Turkey. J Asian Earth Sci 29: 911-927. Özgen-Erdem N, İnan N, Akyazı M, Tunoğlu C (2005). Benthonic foraminiferal assemblages and microfacies analysis of Pa- leocene–Eocene carbonate rocks in the Kastamonu region, Northern Turkey. J Asian Earth Sci 25: 403-417. Papazzoni CA, Fornaciari E, Giusberti L, Vescogni A, Fornaciari B (2017). Integrating shallow benthic and calcareous nannofossil zones: the lower Eocene of the Monte Postale section (northern Italy). PALAIOS 32: 6-17. Papazzoni CA, Zoboli P (2007). New data on resedimented larger foraminifera from some Paleogene formations of the northern Apennines (Italy). Geol Romana 40: 67-75. Racey A (2001). A review of Eocene nummulite accumulations: structure, formation and reservoir potential. J Petrol Geol 24: 79-100. Rahaghi A (1978). Paleogene Biostratigraphy of Some Parts of Iran. Tehran, Iran: National Iranian Oil Company. Rahaghi A (1980). Tertiary Faunal Assemblage of Qum-Kashan, Sabzewar and Jahrum Areas. Tehran, Iran: National Iranian Oil Company. Rahaghi A (1983). Stratigraphy and Faunal Assemblage of Paleocene- Lower Eocene in Iran. Tehran, Iran: National Iranian Oil C omp any. Rahaghi A, Schaub H (1976). Nummulites et Assilines du NE de l’Iran. Eclogae Geol Helv 69: 765-782 (in French). Rasser MW, Scheibner C, Mutti M (2005). A paleoenvironmental standard section for Early Ilerdian tropical carbonate factories (Corbieres, France; Pyrenees, Spain). Facies 51: 218-232. Reiss Z, Hottinger L (1984). Shell producers in the water column. In: Reiss Z, Hottinger L, editors. The Gulf of Aqaba. Berlin, Germany: Springer, pp. 89-138. Sarkar S (2017). Microfacies analysis of larger benthic foraminifera- dominated Middle Eocene carbonates: a palaeoenvironmental case study from Meghalaya, NE India (Eastern Tethys). Arab J Geosci 10: 121. Schaub H (1981). Nummulites at Assilines de la Téthys paléogène: taxinomie, phylogenèse et biostratigraphie. Atlas I. Basel, Switzerland: Birkhäuser. Scheibner C, Rasser M, Mutti M (2007). The Campo section (Pyrenees, Spain) revisited: implications for changing benthic carbonate assemblages across the Paleocene–Eocene boundary. Palaeogeogr Palaeocl 248: 145-168. Scheibner C, Speijer R (2008). Late Paleocene–early Eocene Tethyan carbonate platform evolution-a response to long-and short- term paleoclimatic change. Earth-Sci Rev 90: 71-102. Şengör AMC, Altıner D, Cin A, Ustaömer T, Hsü K (1988). Origin and assembly of the Tethyside orogenic collage at the expense of Gondwana Land. Geol Soc Sp 37: 119-181. Serra-Kiel J, Hottinger L, Caus E, Drobne K, Ferrandez C, Jauhri AK, Less G, Pavlovec, R, Pignatti J, Samso JM (1998). Larger foraminiferal biostratigraphy of the Tethyan Paleocene and Eocene. B Soc Geol Fr 169: 281-299. Severin KP, Lipps JH (1989). The weight‐volume relationship of the test of Alveolinella quoyi : implications for the taphonomy of large fusiform foraminifera. Lethaia 22: 1-12. Sirel E, Acar Ş (2008). Description and Biostratigraphy of the Thanetian-Bartonian Glomalveolinids and Alveolinids of Turkey. Ankara, Turkey: TMMOB Jeoloji Mühendisleri Odası. Tirrul R, Bell I, Griffis R, Camp V (1983). The Sistan suture zone of eastern Iran. Geol Soc Am Bull 94: 134-150. Tomás S, Frijia G, Bömelburg E, Zamagni J, Perrin C, Mutti M (2016). Evidence for seagrass meadows and their response to paleoen- vironmental changes in the early Eocene (Jafnayn Formation, Wadi Bani Khalid, N Oman). Sediment Geol 341: 189-202. Tomassetti L, Benedetti A, Brandano M (2016). Middle Eocene sea- grass facies from Apennine carbonate platforms (Italy). Sedi- ment Geol 335: 136-149. Varrone D, d’Atri A (2007). Acervulinid macroid and rhodolith fa- cies in the Eocene Nummulitic limestone of the Dauphinois Domain (Maritime Alps, Liguria, Italy). Swiss J Geosci 100: 503-515. Yordanova EK, Hohenegger J (2002). Taphonomy of larger foraminifera: relationships between living individuals and empty tests on flat reef slopes (Sesoko Island, Japan). Facies 46: 169-204. Zachos JC, Stott LD, Lohmann KC (1994). Evolution of early Cenozoic marine temperatures. Paleoceanography 9: 353-387. Zakrevskaya E (2004). Distribution of larger foraminifera near the Lower-Middle Eocene boundary in the Northeastern Perite- thys. Neues Jahrb Geol P-A: 335-360. Zakrevskaya E (2005). Stratigraphic distribution of Larger Foramin- ifera in the Paleogene of Northeastern Peritethys. Stratigr Geo Correl 13: 66-86. Zakrevskaya E, Beniamovsky V, Less G, Baldi-Beke M (2011). Integrated biostratigraphy of Eocene deposits in the Gubs section (Northern Caucasus) with special attention to the Ypresian/Lutetian boundary and to the Peritethyan-Tethyan correlation. Turkish J Earth Sci 20: 753-792. Zamagni J, Mutti M, Košir A (2008). Evolution of shallow benthic communities during the Late Paleocene-earliest Eocene transition in the Northern Tethys (SW Slovenia). Facies 54: 25-43. Zhang B (1988). Orbitolites (foraminifera) from Longjiang of Tingri, Xizang. Acta Micropalaeontol Sin 5: 1-13. Zhang Q, Willems H, Ding L (2013). Evolution of the Paleocene-Ear - ly Eocene larger benthic foraminifera in the Tethyan Himalaya of Tibet, China. Int J Earth Sci 102: 1427-1445. ISNAD HADI, Mehdi , VAHIDINIA, Mohammad , HRABOVSKY, Juraj . "Larger foraminiferal biostratigraphy and microfacies analysis from the Ypresian (Ilerdian-Cuisian) limestones in the Sistan Suture Zone (eastern Iran)". 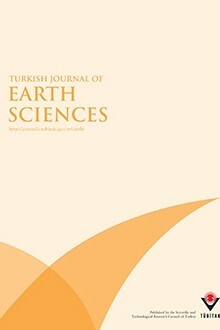 Turkish Journal of Earth Sciences 28 / 1 (January 2019): 122-145.